Texas Longhorns wide receivers coach Jay Norvell (left) follows quarterbacks coach Shawn Watson (right) out the door. 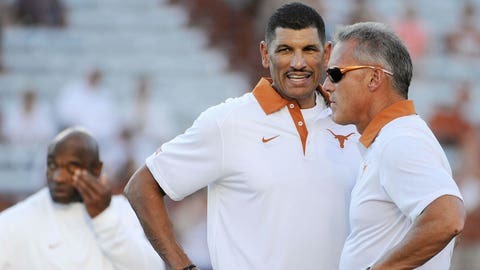 Texas Longhorns wide receivers coach Jay Norvell is leaving UT, a source told FOX Sports on Thursday. The 52-year-old Norvell is expected to become Arizona State’s new receivers coach and may get the title of passing game coordinator as well, according to the source. Norvell spent the final 11 games of the 2015 season as Texas’ play-caller. He is the fourth member of the UT offensive staff from 2015 to exit Texas, following Tommie Robinson, Joe Wickline and Shawn Watson. On Tuesday, Charlie Strong announced that defensive backs coach Chris Vaughn would not be back on the UT coaching staff as well. The news of Norvell’s exit was first reported by 247 Sports.